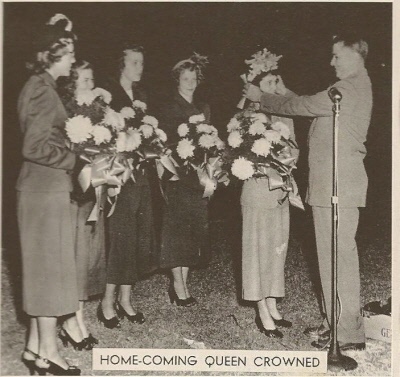 By Charlie Sedman: I finally identified the first homecoming queen, crowned at the first homecoming game against Rossville on Oct 22, 1949. Shirley Sewell is shown being crowned by an Alumni Association bigwig, probably Ernie Feagans, who was never very far away from a microphone. Other candidates were Jeanine Watson, Geraldine Maxey, Hulene Huff, and Evalynne Anderson.